In this exercise you will create an animation similar to the one above except that you will use your name instead of DANNY. You will learn how to use Adobe Animate to zoom down letters and to change their positions and opacity during that zoom. You will also insert some script to make the animation stop. If you do not have Animate, download a 7-day trial version from the Adobe site. You will need to create a no financial cost Adobe account in order to download it. You might want to download these demo files if you want to see a completed example. * AntiAlias is not supported in HTML5 Canvas document, and has been converted to CanvasFonts in an instance of Text. This message informs us that edges of text may appear jagged and not smooth due to a limitation of the HTML5 canvas element. But with the large text that you will use in this exercise the problem is not visible. Ignore the warning in this case. Note that other output messages may appear and can generally be ignored. Also note that the Output panel is in the same panel group as the Timeline panel. When the Output panel is displayed you will need to click on the Timeline panel's tab to return to the Timeline, which is where most of your work will be done. In the Preferences dialog box: User Interface > ...then try the different interfaces to select the one you want to work with. My personal preference is Lightest because it provides the most contrast. Then select in the menu at the top right of the interface Classic. That is my preference. File > New > ...the New Document dialog box will open. Select Web at the top. Select a folder where you will be able to locate it when you are done. Replace yourlastname and yourfirstname using YOUR last and first names. First, decide on what form of your name you want to use. Limit the letters you use to no more than about seven otherwise you will have to do more work than required. You do not need to use your exact name. You can use your familiar name. For example, my name is, formally, Daniel. But my friends call me Dan or Danny. I could use any of those. But if my name were Alexander I may want to use Alex. Find the Tools panel. It is a vertical panel and is probably on the far right. Select the text tool: it is the T in the Tools panel. Click on it to select it. Before you begin to enter your name, Select a font, font size, and color using the Properties panel, which will probably be on the right side. If you do not see it, use Window > Properties to open the panel. For the font, please use a common font and not anything exotic. For example, Arial or Times New Roman. I recommend using bold text. Set the size to about 50. To set the size, double click on the current value (probably 12) and type in 50. Don't be concerned with the size now. The size can be easily adjusted later using subsequent instructions. You can also select a color for the text in the Character section of the Properties panel. Now type in your name. After you have created the letters, select the Free Transform tool. It is the third tool from the top of the toolbar, beneath the black and white arrow tools. As with all tools, you can hover over the tool and a tooltip will appear identifying it. There will now be a bounding box surrounding your name. Click and drag on the word to position it in approximately the center of the white background. Click-drag on any corner of the bounding box to increase or decrease the text size. Adjust the size of the name to be as big as possible without going beyond the edges of the white background. This will "break" the word into individual letters. First create enough layers by clicking on the little "page" icon on the top left edge of the Timeline panel. Create a layer for each letter. For example, if your name was Jimmy you would need to add four more layers. Using Paste in Place will paste the letter in the same position as it was when you cut it. Do not use Paste because it will paste the letter in to the center. Cut the second letter and again use Paste in Place to paste it into the second layer. Be certain that you have selected the second layer before you do. Continue the process until every letter is in its own layer. 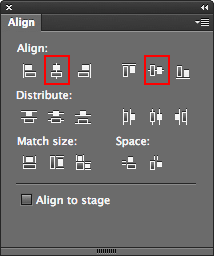 Double click on the layer name and enter the single letter that is on that layer. If you have more than one of the same letter, add a 1 or 2 after the name as in the example below. 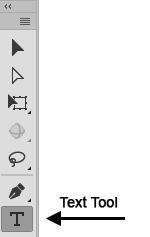 Check that there is only one letter per layer by clicking the black dot in the layer in the "eye column" to turn off the visibility of the content of the layer. The proper letter ought to disappear. Then click on the "X" to restore the layer visibility. For example, if you want to be sure that the first letter is in the top layer, turn its visibility off and on. Convert each letter into a symbol. Symbols facilitate the animation process. Click on the first letter. Name each symbol for the letter that it contains. In the Timeline, carefully click, hold, and drag from frame 85 in the first layer down to frame 85 in the bottom layer so that only frame 85 is selected in every layer. Press F6 (or Insert > Timeline > Keyframe in the event that F6 does not work). This will create a single keyframe for each of those frames, thus establishing the end position of the zoom-down. A keyframe is indicated with a small black circle in a frame rectangle. Keyframes are used to store information about the animation such as important positions used to calculate (interpolate) the frames between keyframes. Click on the number 1 in the timeline. This will bring the playhead (a reddish indicator) to the first frame. The alignment puts the letters in front of one another so that they occupy the same space. Press Ctrl-A to ensure that all the letters are selected. 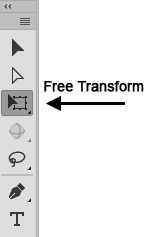 Then select the Free Transform tool again. The letters will now be invisible. This is temporary. In the Timeline click and hold on any frame or frames in the first layer and drag down to the last layer. You can select more than one frame in each layer as you drag. Do NOT include the last frames (the end keyframes) in the selection. You can have more than one frame selected in each layer. You need to have at least one frame in each layer selected. Right-click on any of the selected frames. A purple color ought to appear in each layer. You can preview your animation in Adobe Animate by pressing the Enter key (Mac: Return key). This will play the animation only once, but you can press the Enter/Return key again and again to play it as many times as you like. You can also preview your animation in your browser by pressing keys Ctrl-Enter (Mac: ⌘-Return). The animation will play repeatedly because that is the default behavior. You will be limiting it to play only once later in this tutorial. If you do play the animation in your browser you may get the following warning in the Output tab. This warning can be ignored. If you do get this warning, click on the Timeline tab to return to the Timeline. Next, you will take steps to cause each individual animated letter to start its zoom down, and also arrive at its end position, at discrete intervals, starting with the first letter and ending with the last. This will be done so that the first letter will zoom down, and also arrive at its final position, before the other letters do. The subsequent letters will do likewise at increasingly delayed intervals thus staggering the animations. Doing this will make the animation more interesting. The animation at the top of this page was accomplished using this technique. To do this you will need to do the following for each and every keyframe, one at a time: Before you begin please read each of the steps in this section. After reading the steps, execute them. Click to select the first, left-most keyframe in the top layer, which is the layer containing the first letter of your name. The frame will now appear selected – but very subtly. Then, click again on that selected keyframe, but now continue to press down your mouse button and simultaneously drag the keyframe sideways (within the same layer - not up or down!) until the keyframe position is similar to what you see in the illustration at the bottom of this page. However, note that you will not yet have the Actions layer that is shown at the top of the illustration. That special layer will be created in subsequent steps. Using the same technique, reposition each of the remaining starting and ending keyframes to be similar to the illustration at the end of this tutorial. If you want to reposition a keyframe, click on that keyframe to select it, then release the mouse button, then click-drag it to the location you want, being sure to keep it within the same layer. When done, the animations of each letter ought to be staggered in time (offset in time relative to each other). That offsetting is depicted in the illustration at the end of the page. Please note that when you done, the last frame in all of the layers except the bottom layer (layer Y in the illustration) is not a keyframe. It has a little vertical rectangle in it. That frame represents the end of the visibility of the content of that layer. In this case it is frame 85. Move the playhead (the reddish vertical marker in the frame numbers row) to the last frame, 85. If you hover over the angle brackets a tooltip will appear indicating that it is the Code Snippets button. Click on the angle brackets < > button. The Code Snippets panel will open. Code Snippets is a library of commonly used script code that can be added to your by simply double-clicking an action in the panel. We want the last frame to stop the animation, which would otherwise Loop - which means to play repeatedly without stopping. 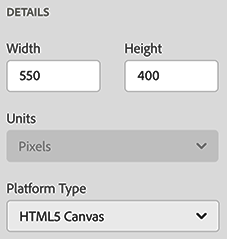 Use the triangular arrow toggle to open the HTML5 Canvas folder. You will see that a /* comment */ describing what the action does has been added. This code will stop the animation when the last frame has been reached during playback. This prevents the animation from eternally looping. Close the Actions and the Code Snippets dialog boxes. Note that a new Actions layer has been created above the existing timeline layers. Look closely at the last frame in that layer and you will see a small a ...which indicates that a frame action has been placed in that frame. Below is the timeline in its final state.